The area’s first inhabitants, the Cherokee Nation, lived in the area between Rocky Ravine and City Lake Park. They lived near the “division of the waters.” There is a continental divide in downtown Haleyville where water runs north to the Tennessee, south to the Warrior and west to the Tombigbee. When the Cherokee were forced out in 1836, many refused to go and and later intermarried. Many names of prominence today trace their roots to our Indian heritage. Richard McMahan of Lauderdale County established the first settlement of a permanent nature in Winston County near Haleyville in 1820, one year after Alabama was admitted to the Union. John Byler completed his famous “Byler Road” through this part of Winston County in 1821. This toll road was the first road of any kind built through this section of the state. The completion of this travel artery by John Byler was the first connecting link between the Tennessee Valley of North Alabama and Tuscaloosa. He used the natural ridge and lay of the land that the Indians knew about to plan the road through this area. Union General J.M. Wilson passed over the road in March, 1863, with 15,480 calvarymen (one of the largest calvaries in world history) in route to the Battle of Selma. On July 4, 1863, Winston County had a “getting-out” meeting at Looney’s Tavern. This area was hilly, rocky and infertile,and most folks did not own slaves or live off the land, and Winston County loyalists did not want to fight against “Old Glory,” so they wanted out of the fighting and to be left alone, so they met and thus “the Free State of Winston”. However, many were conscripted into the army and many families had one child fighting for the North and another for the South. In 1883, William “Bucky” Davis owned 40 acres of land around the downtown area of Haleyville. The Columbus and Tuscaloosa roads intersected here thus the community was called Davis Cross-Roads. Mr. Davis built the first log house in the area where the Traders and Farmers Bank is now. The announcement of a railway from Sheffield running through Winston County in 1884 brought Neely J. Drewry here. Charles L. Haley left Buttahatchee in 1885 and came to Davis Cross-Roads and opened a general merchandise store. His father had purchased one thousand acres for a dime an acre in Marion County. His brothers, Walker and John, worked for him as clerks. It became one of the largest mercantiles because of their progressive policies. After the railroads were built the name was changed to Davis Crossing. It is told that the name was changed to Haleyville when Bucky Davis went into the Haley establishment to purchase a suit of clothes and exchanged the price of the suit for the name of the town-thus Haleyville. Walker Haley founded the Traders and Farmers bank in 1906. Walker built a two-story, Victorian home where Fred’s Dollar Store is today. The first one room school dates back to 1889. For years the Church of Christ, Baptists and Southern Methodists held a union Sunday School in the building owned by the Church of Christ. It was established the same year. It was the manufacture and sales of mobile homes that really put Haleyville on the map. Beginning in the late 1960s Don Tidwell operated Tidwell Industries. Haleyville was home to a large textile plant and other support industries. The late 1980s were hard for Haleyville. Plants closed, jobs were lost and the elementary school burned. But the same independent spirit that kept the Indians here, that brought the Haleys here; the same unity exhibited in union Sunday School among churches in the 1800s, resulted in our beautiful $5 million facility across from the High School. Even though our population has decreased in the last 30 years, that same independent, fiery spirit is producing some of the brightest, most-talented students, who are becoming lawyers, doctors, teachers, and dentists. Celebrities like Pat Buttram, Polly Holiday, Lonzo and Oscar, the Speer Family, and Lili Zannuck, to name a few, have exhibited this same Haleyville spirit in their work recognized by the nation. Our dream is that our Haleyville talent will be able to reside in these quiet hills of North Alabama with good jobs, raising good families with good values. We have always been independent, but we can work together and get the job done. Our history has taught us that “in tough times, the tough get going”; we are from the Free State of Winston and we’re ready! It was the manufacture and sales of mobile homes that really put Haleyville on the map. Beginning in the late 1960s Don Tidwell operated Tidwell Industries. Tidwell industries was a major force in the manufactured housing. Tidwell also expanded into furniture manufacturing at the Pine Designs plant, aircraft refurbishing at Posey Field and van conversion. Haleyville was home to a large textile plant, Haleyville Textile employing over 400 individuals, later changed to Bama Textile and other support industries for the manufactured housing industry. The quantity of available labor and the private ownership of property greatly influenced the location of plants. The proximity to the manufactured housing plants resulted in the location of several suppliers in the Haleyville area. In 1968, AT&T reserved the digits 9-1-1 nationwide for emergency use. Haleyville introduced the first 9-1-1 system, which was located at the police station at City Hall. 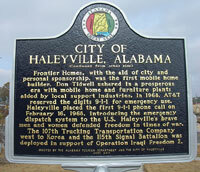 Alabama Speaker of the House, Rankin Fite, made the first call and it was answered by Congressman Tom Bevill on a bright red telephone on February 16, 1968, thus Haleyville is the home of the first 9-1-1 call. A Historical Online Database can be found at The Free State of Winston created by Peter J. Gossett and the Winston County Genealogical Society. 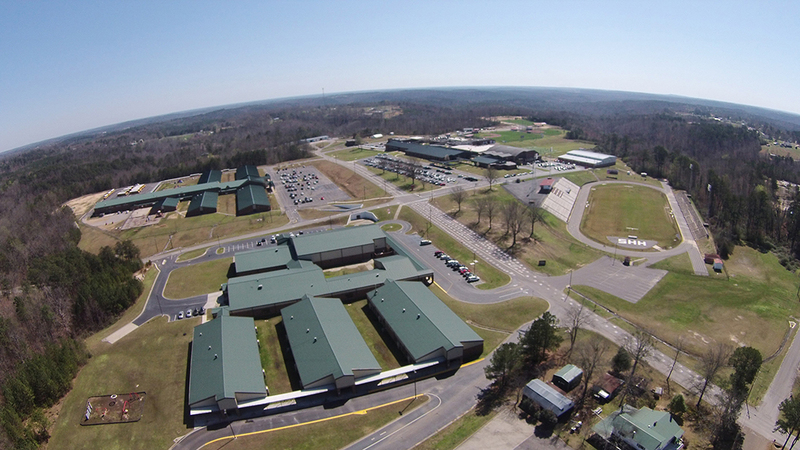 Comprising 614 square miles, Winston County is located in the foothills of the Appalachian Mountains in northwest Alabama. It is part of the Cumberland Plateau physiographic section, and its terrain varies from low, rolling hills covered with evergreens to spectacular gorges, rock bluffs, and hardwood forests. Much of Winston County sits on the Warrior Coal Field, and the county’s soils are a mixture of plateau and coastal soils. Winston County is bordered by Franklin and Lawrence counties to the north, Cullman County to the east, Walker County to the south, and Marion County to the west.